Two of the most recognizable brands in adventure — Hot Wheels and Star Wars — have formed an alliance! 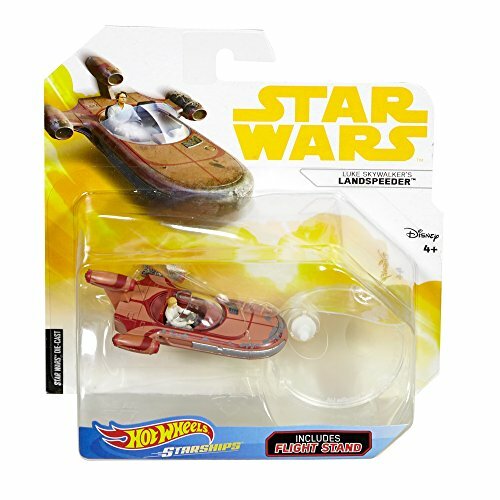 Launch into hyper drive with one of the most iconic starships from Star Wars, brought to you by Hot Wheels. Kids will love re-creating some of the galaxy’s most epic battles and fiercest showdowns with this detailed die-cast starship. Attach the flight stand (included) to display your Starship collection. Each sold separately, subject to availability. Not for use with some Hot Wheels sets. Colors and decorations may vary.Launch into hyper drive with authentic die-cast replicas of fan favorite Starships!